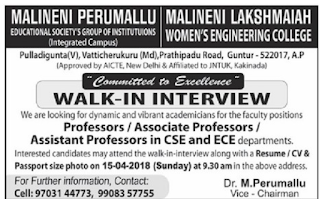 Malineni Perumallu Education Society's Group of Institutions, Guntur has advertised in THE Eenadu newspaper for recruitment of Professor / Associate Professor / Assistant Professor jobs vacancies. 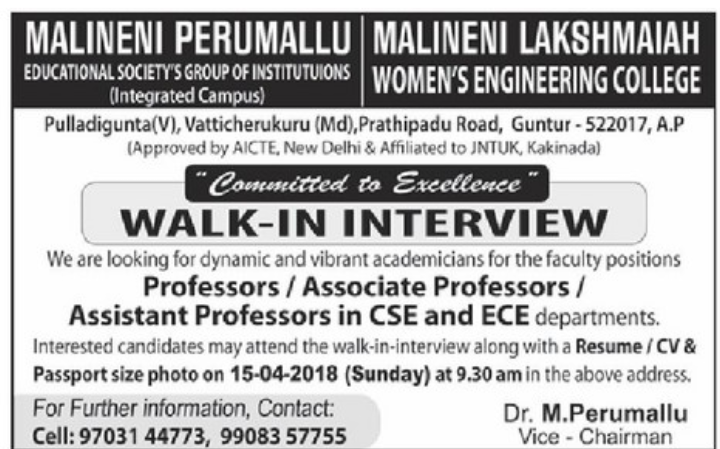 Interested and eligible job aspirants are requested to walk-in 15th April 2018. Check out further more details below. How to Apply: Interested candidates may attend the walk-in interview along with a Resume/CV & Passport size Photo on 15-04-2018,Sunday at 9.30 a.m in the below address.